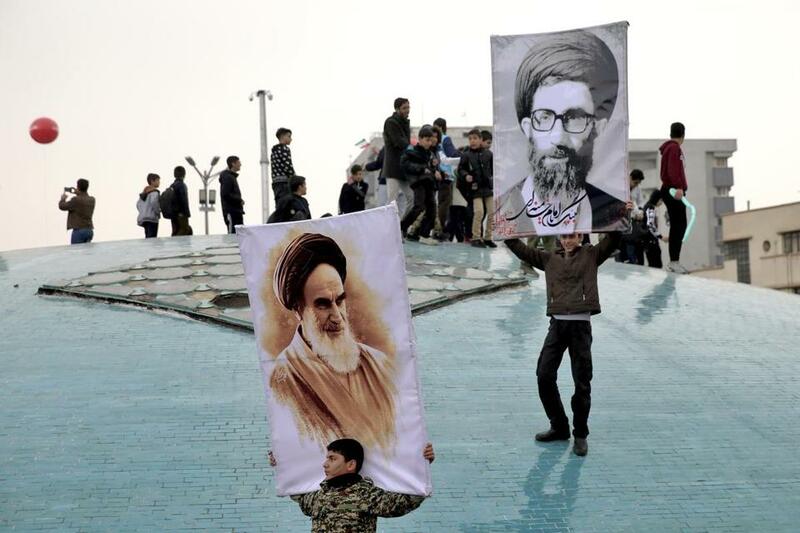 Two boys held up posters of Iranian Supreme Leader Ayatollah Ali Khamenei (right) and late revolutionary founder Ayatollah Khomeini during a rally marking the 40th anniversary of the 1979 Islamic Revolution in Tehran Monday. TEHRAN — Braving a drenching rain, Iranians came out in droves Monday to march up Revolution Street to the capital’s Freedom Monument, including families pushing strollers decorated with balloons in the red, white, and green of the country’s flag, clerics, teenagers, and others, for a huge state-backed rally commemorating the 40th anniversary of the Islamic Revolution. Three men, a father and his two sons, paraded a foam effigy of a smiling President Trump with a bloated head. “Two years ago we made Obama, but this Trump is our best creation to date,” said one of the sons, Mohammad Zaerin, 27. There was no way they would burn it during the rally, he added. In numerous interviews, the rally participants seemed well-informed about the issues facing the country, which are numerous. Economic specialists are predicting an inflation rate of as much as 50 percent in the coming year, starting from March 21 in Iran. The government is grappling with a large loss in oil income, attributed to Washington’s pressure on buyers combined with low oil prices. The rial, Iran’s currency, has lost nearly 70 percent of its value in the past 12 months, making imports prohibitively expensive. Unemployment is high, and industrial production is down. There have been sporadic labor protests, dozens of dissidents have been arrested, and security forces are on high alert for possible terror attacks. Mismanagement and corruption, reported on extensively by foreign-based Persian-language satellite channels, have strongly undermined faith in Iran’s leaders. The mother of two had come out to commemorate not only the revolution but also her brother Mohsen, who had died in the trenches during the bloody eight-year war with Iraq in the 1980s. “We mustn’t forget the sacrifices many have made,” she said. Heydari and others present at the rally pointed to progress made since the revolution, including the participation of women in universities, achievements in nanotechnology, and scientific papers. Mohsen Shahroudi, a midlevel cleric, said the revolution had brought Iran freedom and evolution. But he acknowledged that there were Iranians who do not like clerics. Another cleric, Taghi Mollah Ahmad, passed by and chimed in. Rouhani praised the crowd’s size as a victory for the system he represents, even though many in this city of 12 million stayed home, many out of sheer apathy.